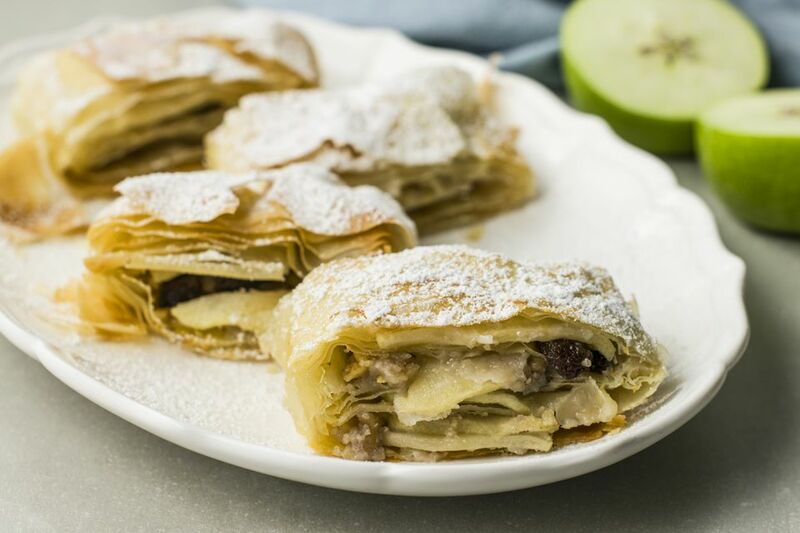 This recipe for Croatian apple strudel, strudel od jakuba, is made with filo dough and is from Klara Cvitanovich, co-owner of Drago's Restaurants in New Orleans, Metairie, La., and Jackson, Miss. This is one of the desserts, along with fritule and krostule, she serves her family for the Christmas holidays. The pita or pastry dough was always made by hand but, now, with filo dough so readily available, Cvitanovich uses it to make her strudel. You might also enjoy reading all about Croatian strudel. On a clean, dry dish towel, place 1 sheet filo dough. Brush lightly with melted butter, beginning with edges and working toward the center. Repeat with 4 more sheets of filo dough, placing them one on top of the other. Remember to butter the fourth sheet. Place half the sliced apples evenly along one long side of filo dough in about a 4-inch-wide strip. Then sprinkle half the nuts, raisins, zest, sugar, and breadcrumbs over the apples. Roll jellly-roll fashion, using a dish towel as an aid. Turn the ends under and brush the entire strudel with melted butter. Place seam-side down on a parchment-lined sheet pan. Repeat with remaining 5 filo sheets and rest of filling. Bake about 45 minutes, or until golden brown. Remove from oven, cool, and dust with confectioners' sugar.